Barry Gerson (b.July 3, 1939, Philadelphia, PA) is an artist-filmmaker who has made films, sculptures, photographic constructions, digital film installations, and mixed painting/photo works. Gerson was born in Philadelphia, Pennsylvania, where his father owned a chain of movie theatres. Self taught, Gerson is most noted for his films. He made his first film, The Neon Rose, in the early nineteen sixties; since then he has completed over thirty-four films which have been shown in one-person shows at The Museum of Modern Art, The Whitney Museum of American Art, The Guggenheim Museum, and in group shows at museums, libraries and institutions internationally. Retrospectives of his work have recently been mounted at Anthology Film Archives and The San Francisco Cinematheque, and most recently in “The Parting of the Clouds” at Thomas Erben Gallery (NYC), and “Episodes From The Secret Life” at Microscope Gallery curated by Mónica Savirón. 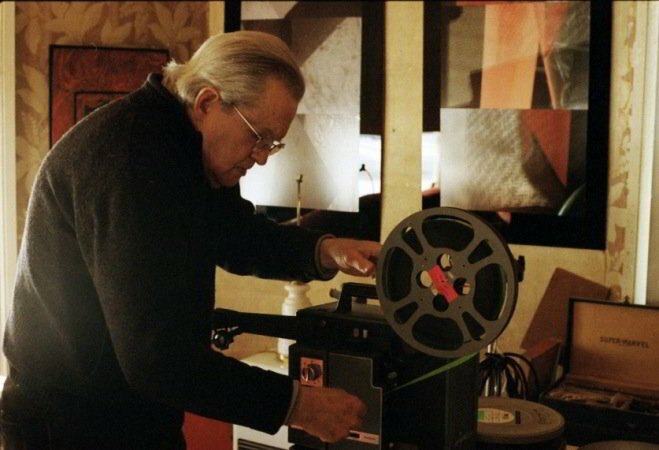 His films have also been included in historic group shows such as The Montreaux Film Exhibition, Une Histoire Du Cinema, and The American Century Show at the Whitney Museum, Brooklyn Academy of Music, Toronto Film Festival, Museum d’Art Contemporani de Barcelona, Berlin Film Festival, and the New York Film Festival, Views From The Avant-Garde 2009 and 2013. His work is in collections around the world including The Museum of Modern Art (NYC), Museum of Modern art (Stockholm, Sweden), Centre National D'Art Et De Culture Georges-Pompidou (Paris, France), etc..He is the recipient of many awards including a fellowship from The John Simon Guggenheim Memorial Foundation. He has taught filmmaking, film installations,and film aesthetics at Bard College, Edinboro State College, S.U.N.Y. - Buffalo, The University of Wisconsin- Milwaukee, The Rhode Island School of Design, The School of the Art Institute of Chicago, and Hamilton College. Three of his films are part of the now historic Castelli Sonnabend Tapes and Films Collection. He currently resides in Potter Hollow, New York. For all inquiries concerning Barry Gerson's films and HD videos please contact Thomas Erben Gallery in New York City at [email protected] or by phone at +1 212-645-8701. Over the past 54 years I have worked in various mediums, each having informed the other in a symbiotic relationship of images and ideas. My over-riding concern has involved an ongoing investigation to illuminate the spiritual in the physical world- to make it perceptible, palpable. Since all matter in the Universe pulsates rhythmically, it is therefore , in constant motion. My film/videos become an activated metaphor to elucidate this phenomenon . I attempt to create psychically charged images that are in a constant state of flux- structured formally but with a poetic intent. Through the use of slow movements and small changes the images become felt, eliciting an almost tactile response. Since 2001, my use of the observed world has, to some extent, given way to an imagined space created in the studio through the use of minimal sets composed of objects, that I paint, interacting with controlled light and shadow. At a certain point in time I began to mix the use of studio objects with elements of the real world. This has enabled me to meld my mind images with material from the natural world. An emphasis is placed on light, color, and texture, elucidated by the use of slow, deliberate, camera movements. This creates a sense, as if one is feeling, touching, the images. i.e. forms responded to by ones whole body. It becomes an “imagistic sculpture”, about volumes in motion and space. The colors, in many cases, are produced as a direct result of the mixing of certain natural and studio lighting with specific colors (painted form surfaces). A new shade and intensity of that color is created. Objects are recognized as being from the “real world”, yet their appearance out of “normal” context, causes us to question- just what are we experiencing.